1In a large mixing bowl, combine a package of active dry yeast and 1 1/2 cups warm water. Wait two to three minutes for the yeast to rise. 2Mix in 1/2 cup flour and 1 teaspoon sugar. 3Add 2 tablespoons olive oil, 2 teaspoons salt, and 3 1/4 cups flour, and work the ingredients together. Use your hands or a large wooden spoon. 4Transfer the dough to a smooth flour-dusted surface and knead it until the dough is smooth, about 5 minutes. 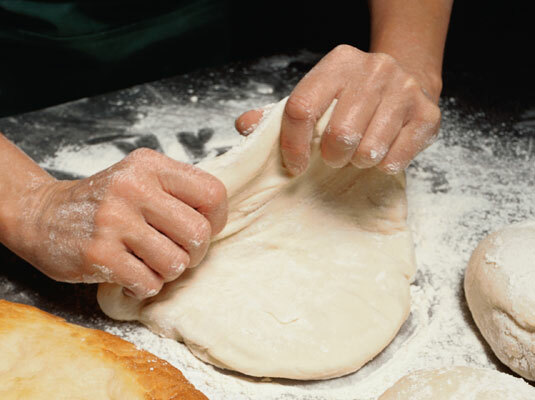 If the dough becomes sticky when kneading, gradually add up to another 1/4 cup flour. 5Place in a large bowl that’s been lightly greased with olive oil, cover the bowl, and allow the dough to double in size. 6Divide the dough into two pieces and roll them into balls. 7Place a ball of dough on a floured counter or work surface, and flatten it with your hands. Keep stretching and pressing down on the dough until it reaches the desired size. 8Slide your hands underneath the dough and lift it onto an oiled pizza pan. Depending on the size and shape of your dough, you can also use a baking sheet. 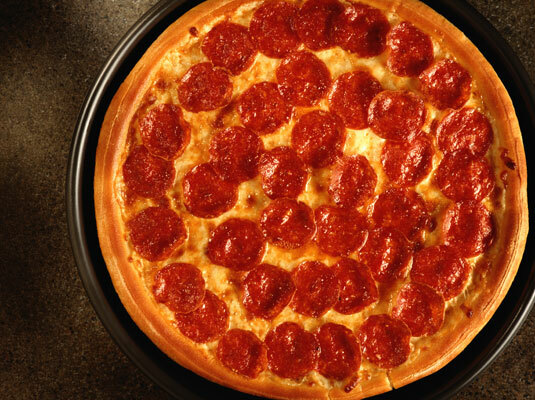 9Place your toppings on the dough. Toppings on traditional Italian pies are generally light. Italians are aghast at American pizzas with tons of meat and cheese. 10Bake the pizza in a 450-degree oven until the cheese turns golden brown in spots and the edge of the crust looks golden brown. If you have any doubts, carefully lift up the crust with a metal spatula (plastic can melt) to see whether the bottom of the crust is lightly browned.